LOS ANGELES - April 30, 2015 - PRLog -- The Academy of European Arts and Culture is pleased to today release a remastered and newly compiled album by the cherished philosopher Mervyn Brady. “Poems That Point The Way” was originally recorded and released in 1997 and today’s remastered release features a new track of excerpts shared by Mervyn from Walt Whitman’s “Song of Myself” recorded not long before the beloved Teacher’s passing in 2006. "This album has been lovingly remastered and is complemented by new artwork,” remarked John Manning, President of the Academy of European Arts and Culture. “Filled with superb renderings along with creative and insightful interpretations of some of the most profound spiritual poetry and prose ever written, Mervyn Brady speaks with the authority and authenticity of a true spiritual master." Mervyn Brady was a friend, teacher, and mentor - beloved by many around the world. Mervyn dedicated his life to sharing his understanding of how to find enlightenment through presence, beauty and love, within the complexities of life. Among many wisdoms, he taught that each Soul’s time on this planet has great meaning. The new artwork for “Poems That Point The Way” features original photography and graphic design by London-based Ollie Weait, student and friend of Mervyn Brady. Original music production in 1997 was by JJ Smit and Trudy Reynolds in the Los Angeles area and music production in 2004 was by Antonio Garcia Isaac in Mexico City. 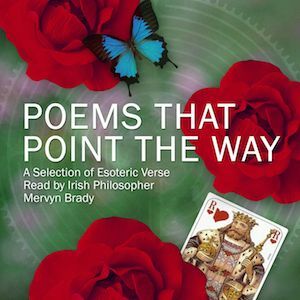 A CD quality download of “Poems That Point The Way” is available for Green Level supporters of the Academy on TuneTrack. The album will be released on iTunes and Amazon in late May.